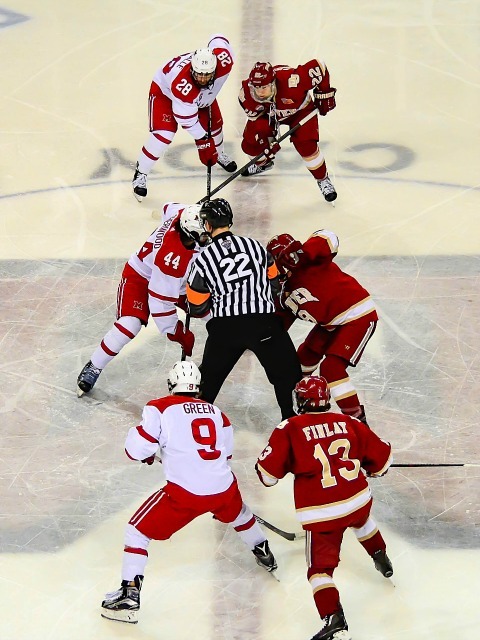 Images from the series played between Denver and Miami at Cady Arena on Feb. 17-18, 2017. All photos by Cathy Lachmann/BoB. 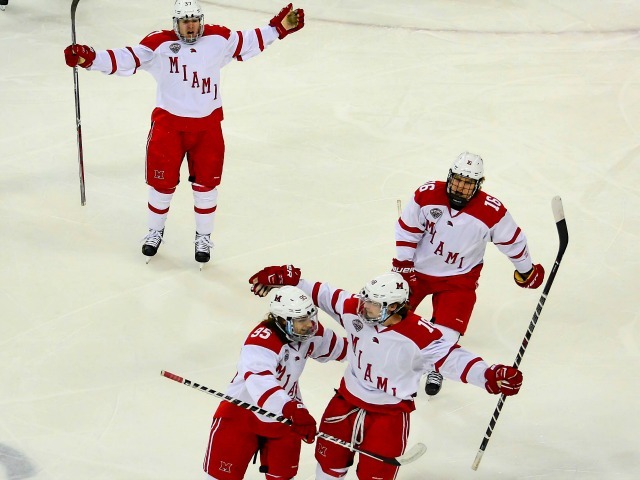 OXFORD, Ohio – Three seasons ago, Miami suffered through a 3-12-1 second half. 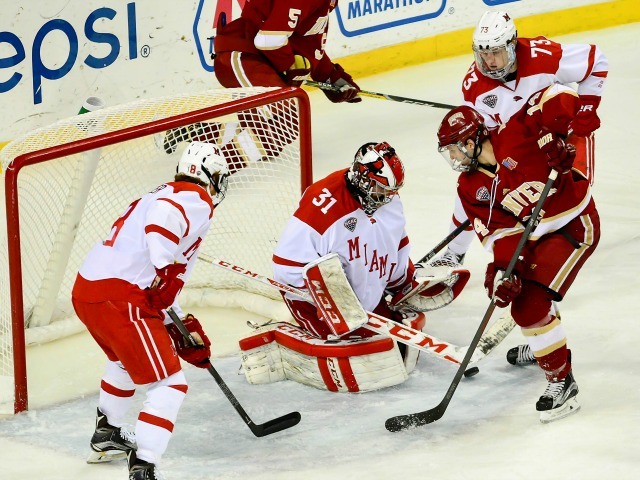 When it became obvious Miami Version 2013-14 would have to win the NCHC Tournament to earn a berth to the NCAAs, preparation for a difficult road series to the open that years’ conference tournament trumped results of the final few regular season games. We’re almost to that point after the RedHawks’s 5-2 loss to No. 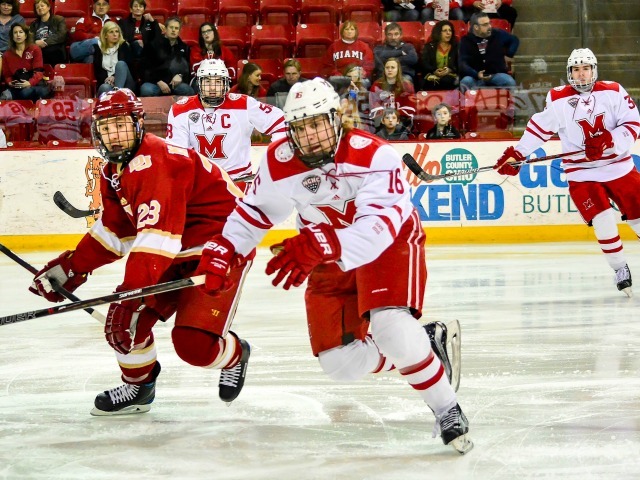 2 Denver at Cady Arena on Friday, as Miami is mired in seventh place in the league standings and would need to make up seven points with five games left in the regular season to earn home ice for the first round of the NCHCs, not to mention pass three teams. And the RedHawks (9-14-6) are out of games vs. two of those three teams they would need to eclipse: Nebraska-Omaha and St. Cloud State. The other is North Dakota, which Miami hosts to close out the regular season in two weeks. 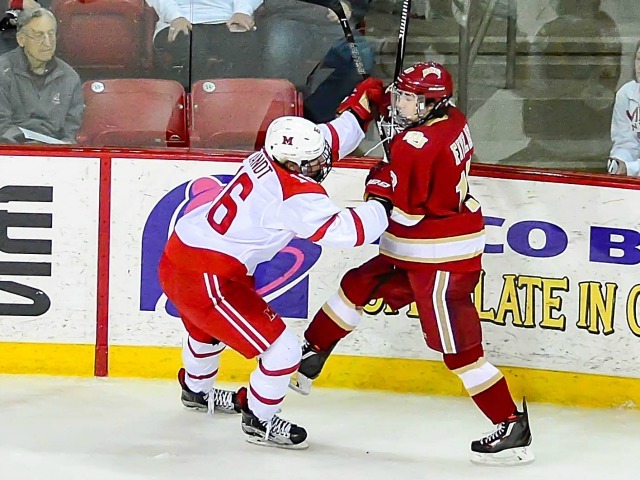 Moving ahead of at least one of those teams would be beneficial, as the RedHawks are currently seventh and would play the league runner-up between Minnesota-Duluth and Denver in a best-of-3. 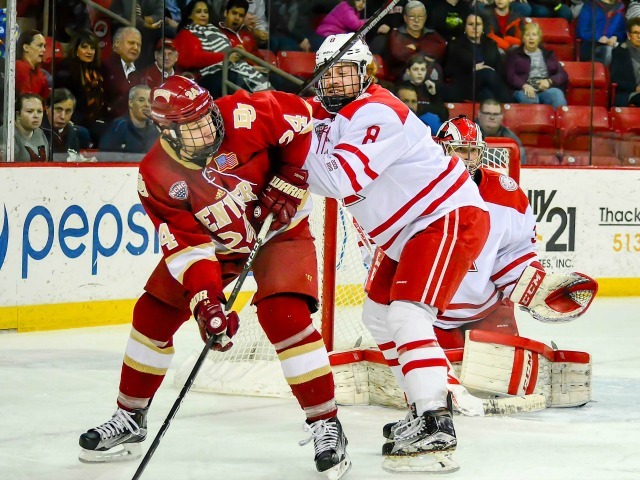 Duluth didn’t work out particularly well last year, and facing the Pioneers in a long series at altitude isn’t particularly appealing either. Western Michigan appears the favorite for the three seed, and Miami didn’t come close to winning either of its games in Kalamazoo, either. And while the four seed is up for grabs – St. 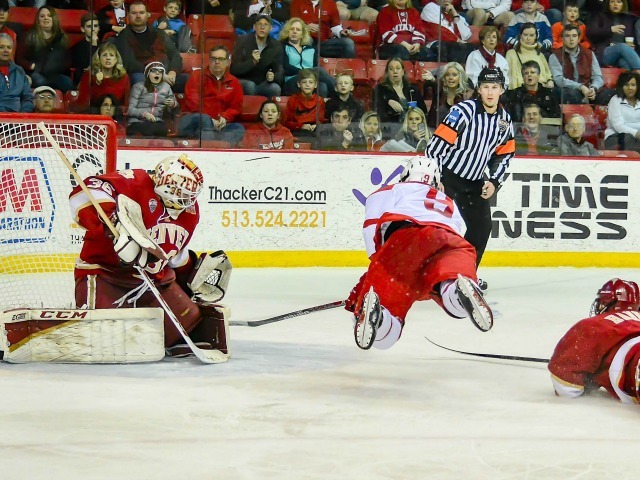 Cloud State currently holds that spot after beating the RedHawks twice on its home ice last week – the five seed may be the toughest in the league, as that team’s opponent is not ensured a spot in the NCAAs and often has a lot more to play for than the relatively safe top three seeds in this league. 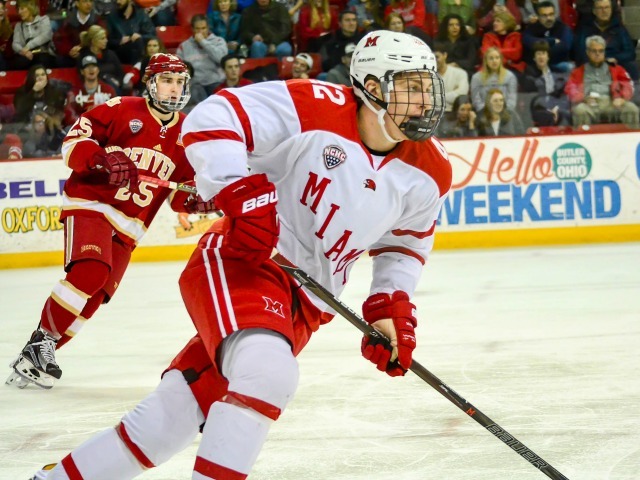 Denver (21-6-4) was the better team on Friday and was in both games in Colorado, which RedHawks goalie Ryan Larkin singlehandedly flipped from losses to ties with his stellar play. We’ve seen first hand that Western Michigan > Miami. 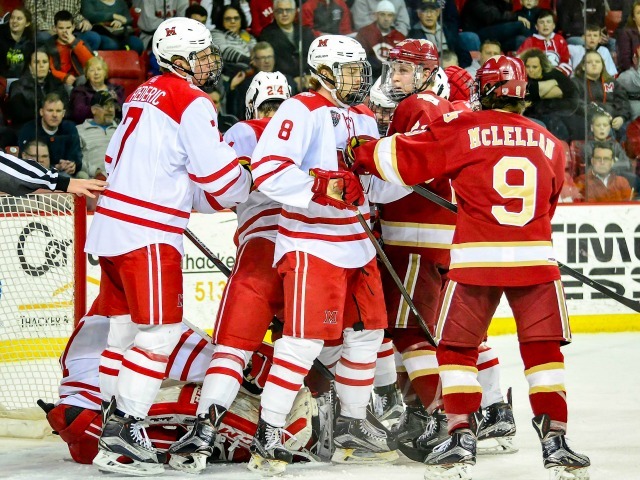 It’s not a stretch to assume to same about UMD, currently the top-ranked team in PairWise. That’s where we are with five games left until the NCHC Tournament. It’s not pretty. 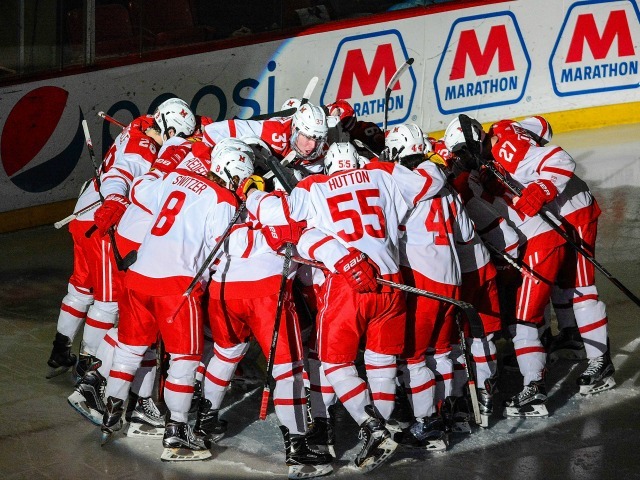 Then again, in 2013-14 the RedHawks went to St. 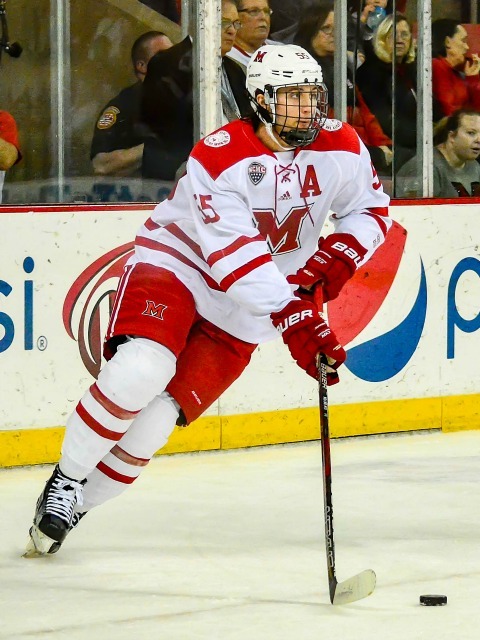 Cloud and shocked the Huskies, sweeping them on their home ice and ultimately falling just short in the league’s championship game in Minneapolis. 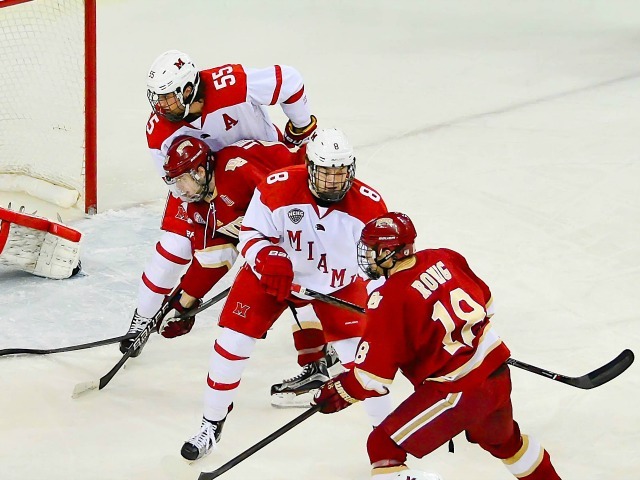 So Miami’s season is still far from over, but the team’s path is similar to that of three years ago: Need a road series win against a top-10 team then a pair of wins at the Frozen Faceoff. The odds are long, but the RedHawks have pulled rabbits out of their hats before when things looked their gloomiest. 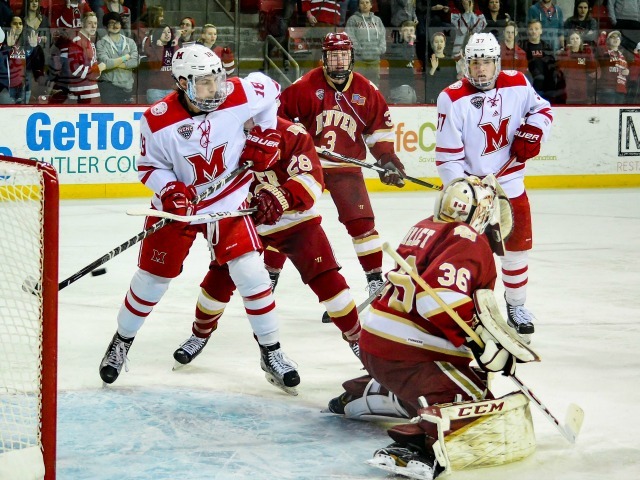 – Denver’s game-winning goal by Will Butcher was a microcosm of Miami’s season. Offensive-zone faceoff win, check. Skate into the slot uncontested. Check. Fire a grade-A shot past a RedHawks goalie who has to be in need of a support group at this point. Check and mate. It was a 4-on-4 and no one picked up Butcher, who has a great shot and should’ve been a defensive priority on that play. – Speaking of summing up this team on one play, on defense, there was a fairly routine situation in the first period that turned into another point-blank chance that Larkin turned aside in which Miami D-men Jared Brandt and Louie Belpedio failed to pick up the shooter despite being seemingly well positioned. BoB said the loss of three quality defensemen to graduation (Matthew Caito, Taylor Richart, Chris Joyaux) could be the toughest thing for this team to overcome. The current D-corps, with the exception of Grant Hutton, just isn’t making anyone pay the price for establishing prime real estate in Miami’s zone. A physical, shut-down set of blueliners has been a staple of RedHawks hockey for two cycles of classes, we’re not getting that, Nos. 1-6, on a regular basis. They have far too often freelanced deep into the offensive zone and gotten caught as well. – The officials certainly didn’t cost Miami this game, but that played a major role by assessing a body checking penalty to Conor Lemirande along the benches (OK, technically they called it interference, but that player had just unloaded the puck, and aren’t those skaters still fair game for the first second at least?). Of course, that went into the net, and after the RedHawks failed to pick up yet another trailer who skated into the slot without paying any kind of price, Colin Sullivan took a penalty right after, and that also ended up in a waved off Denver goal. That was overturned after an eight-minute delay, and there’s a 2-0 lead for the Pioneers with Tanner Jaillet in net. The calls weren’t very good either way, and the linesmen were awful at dropping pucks for faceoffs and in their judgment of kicking playoffs out of the circles. – These lengthy reviews have gotten ridiculous. We saw a 14-minute delay vs. Western Michigan and another eight-minute stopped in this one. Yes, Friday’s call went Denver’s way, but there really needs to be a limit on these stoppages. If a pregnant pause is long enough that players need to skate to keep their legs fresh, as was the case in both of these instances, it needs to be shut down. Of course we want to see all calls made correctly, but most reasonable people realize that college hockey isn’t the pros, or even Division I football or basketball with unlimited HD angles. If a call can’t be overturned in two minutes, the call on the ice stands. Originally that was a good enough stance for the NFL (actually it was 90 seconds), so it should be fine for hockey at this level. – Some positive? 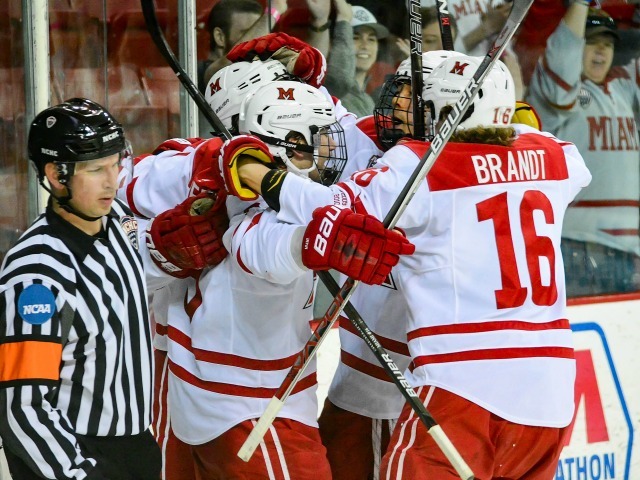 Josh Melnick had the presence of mind to grab the puck before the linesman got it after Brandt scored the tying goal, realizing it was the first of the freshman’s career. And it was a beautiful shot. 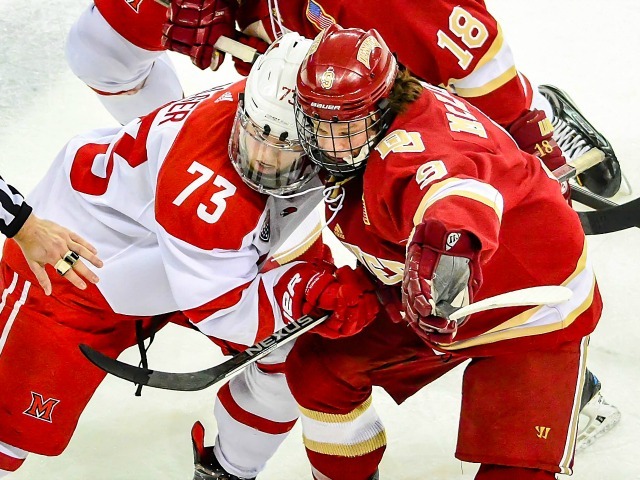 Brandt has gone from the NAHL to playing on the top pairing, facing opponents’ top forwards as a freshman, which is an incredibly difficult role in this league. FORWARDS: D. The Gordie Green-to-LaValle hook up was nice, but this corps did little else. Denver has an excellent coach in Jim Montgomery, and clearly his staff figured out how to shut down Kiefer Sherwood and Anthony Louis, who combined for three shots. Carter Johnson was 6-5 on faceoffs, but overall Miami was an embarrassment on draws, finishing 25-47. Melnick was 9-17 and Sherwood was 5-16. Twelve forwards, 13 shots. DEFENSEMEN: D+. The Brandt goal earns this corps the plus. Too many Pioneers skated around defenseman en route to the net. Too many times Denver skaters took direct lines toward high-percentage scoring areas without being challenged. Too many times we’ve seen this exact MO. GOALTENDING: B. Yes, Larkin allowed four goals on 31 shots, but he got almost no help. The first two Denver markers were both on the power play. Goal No. 1 was on a rebound after he had stopped two point-blank chances from the side of the net, and the puck leaked into the slot. Goal No. 2 was tipped at the top of the crease because a player was left there uncontested. Goal No. 3 was on a wide-open shot from the slot because – say it with me – no one picked up the shooter. Goal No. 4 pinballed but again the scorer was allowed to camp out at the top of the crease. 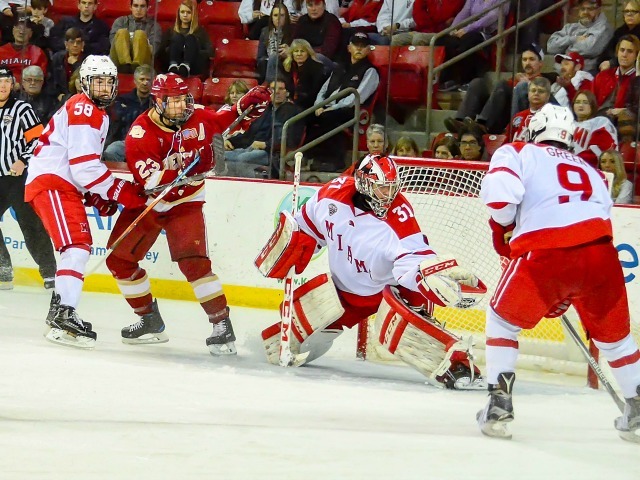 Larkin made the save of the year by coming across the crease and shutting down an A-plus chance. If his D-corps isn’t going to show physicality, maybe he should take a page from Jay Williams take matters into his own hands. An occasional penalty for laying a little lumber is a small price to pay to end this trend of seeing high-caliber scorers practically have their mail delivered to the top of Miami’s crease. This has not been a strong regular season, but imagine how much worse it would’ve been if Larkin wasn’t this team’s primary goalie? LINEUP CHANGES: Defenseman Grant Frederic was back after sitting for four straight games, as Miami went with the seven-defenseman approach with Sullivan cryptically listed as a forward. Forward Alex Alger did not dress. 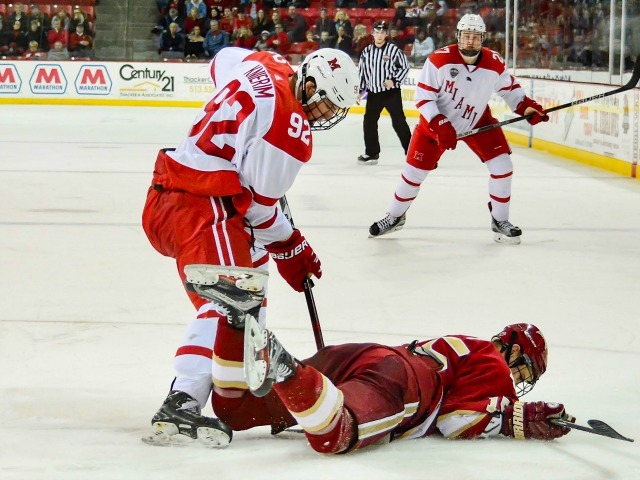 Forward Justin Greenberg missed his eighth straight game with a lower-body injury and was still in a boot. His faceoff prowess was sorely missed. It’s a pretty safe bet to say that Miami was happy to have Ryan Larkin back. 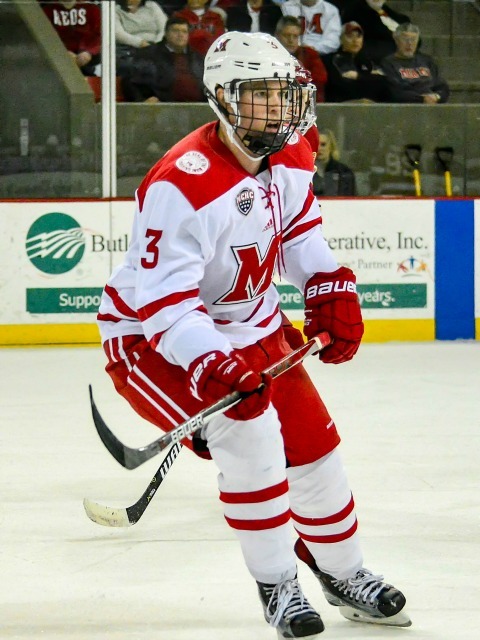 Larkin was pulled from last Friday’s game with an injury and missed Saturday’s contest as a result, but returned to stop a career-high 38 shots as the RedHawks salvaged a 1-1 tie at No. 1 Denver on Friday. 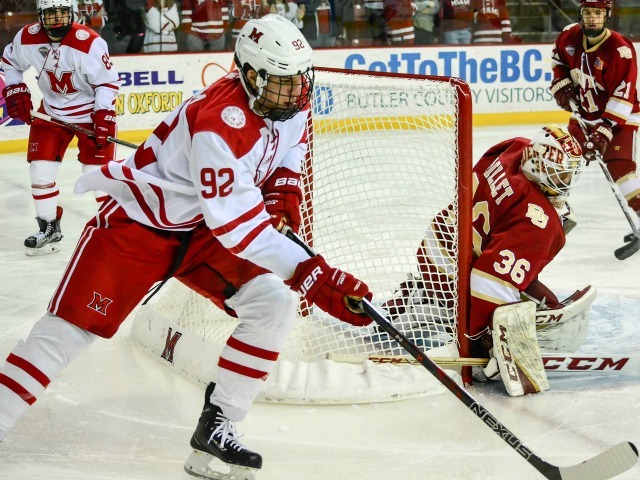 Miami extended its winless streak to six games but it had lost its last five and was 0-4 against its first two NCHC opponents, neither of which were ranked. 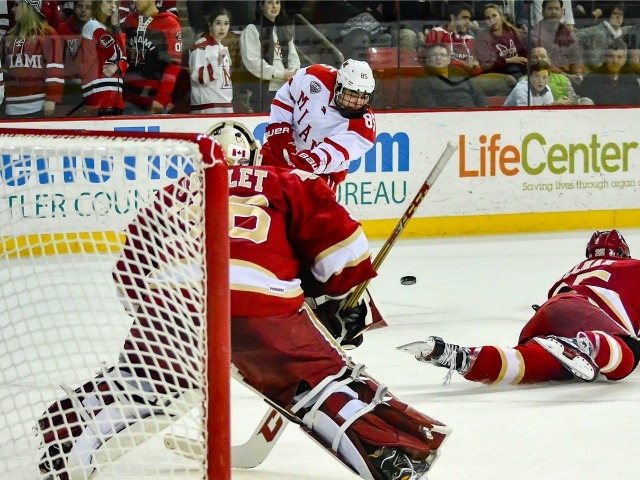 The RedHawks (3-6-3), who received one point after DU won the sudden-death shootout, were outshot, 39-21. 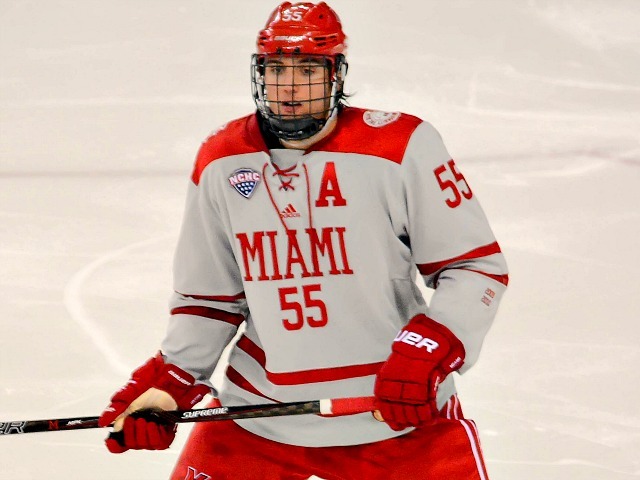 Miami’s only goal came just 1:59 into the game when Anthony Louis stole the puck in the defensive zone, slid a pass to a streaking Grant Hutton, and the sophomore defenseman ripped one by goalie Tanner Jaillet on the stick side. Denver (7-2-2) trailed by a goal after the first period despite leading on the shot counter, 15-3. But the Pioneers tied it in the middle stanza. With 16:02 left in that frame, Troy Terry stole a Bryce Hatten defensive zone pass, went in alone and beat Larkin stick side to tie it. The RedHawks generated 11 of their 21 shots in the second period. After a scoreless third period and overtime, the game was officially ruled a tie. In the second OT for a conference point, Denver outshot Miami, 7-2 in the 3-on-3. 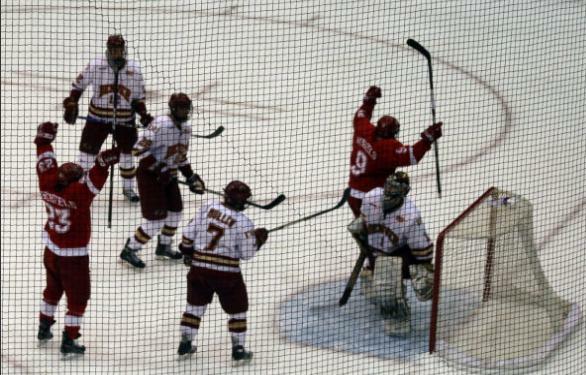 Henrik Borgstrom converted his sudden-death penalty shot but Kiefer Sherwood was denied. Hutton’s goal was his third of the season after he did not record a marker in his first season with Miami. Louis picked up the lone RedHawks assist, giving him helpers in three straight and points in nine of his last 10 games. He now has 102 career points, moving him into sole possession of 49th place on Miami’s all-time leaderboard. 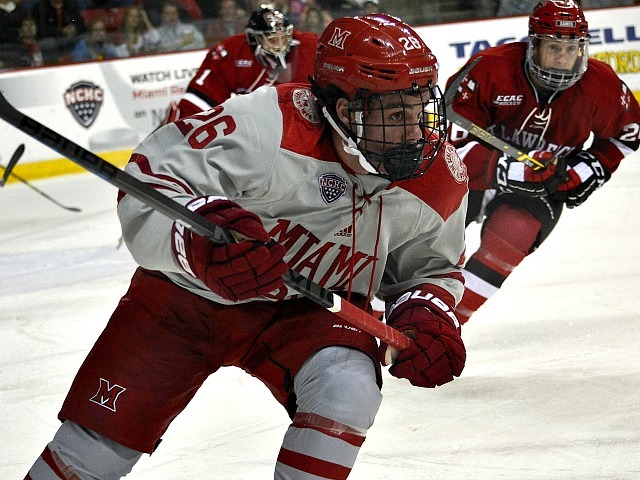 The RedHawks remain in last place in the NCHC, as they picked up their first league point of the season. These teams wrap up their two-game weekend series at 9:07 p.m. on Saturday. OXFORD, Ohio – The .500 mark is finally just a win away. After a 6-11-3 start capped off by a seven-game winless streak, Miami has won four straight games, including a 3-1 win over No. 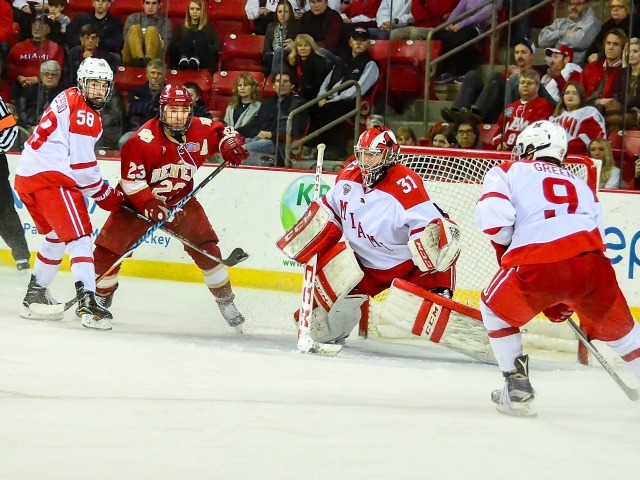 13 Denver at Cady Arena on Friday, to put itself back in NCAA contention. 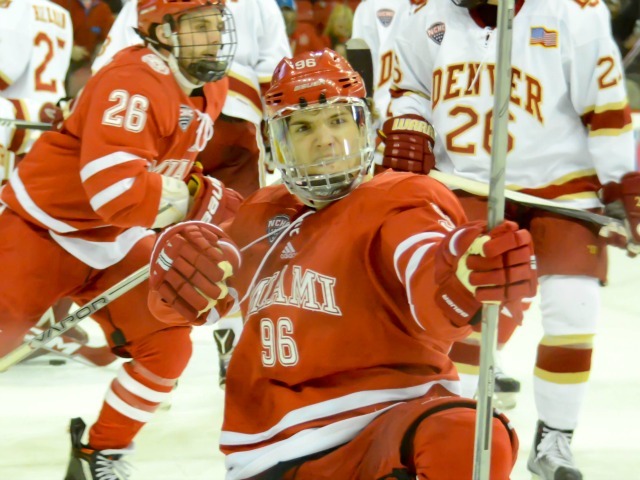 Miami’s Jack Roslovic celebrates his go-ahead goal (photo by Cathy Lachmann). 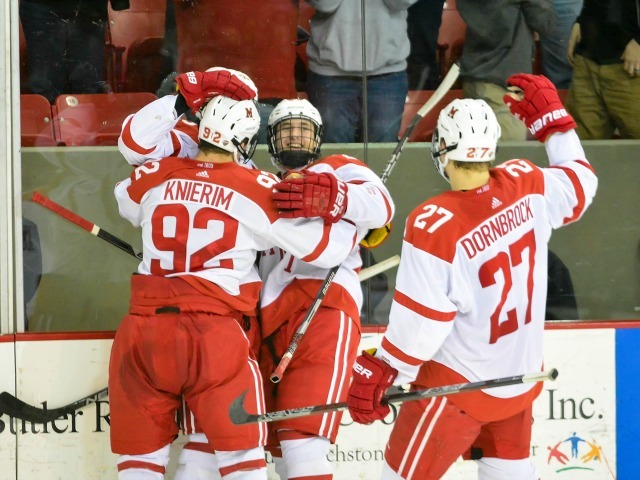 Freshman forward Jack Roslovic broke out of a mini-funk, scoring for just the second time in 11 games, while senior forward Kevin Morris and junior forward Anthony Louis stayed hot. 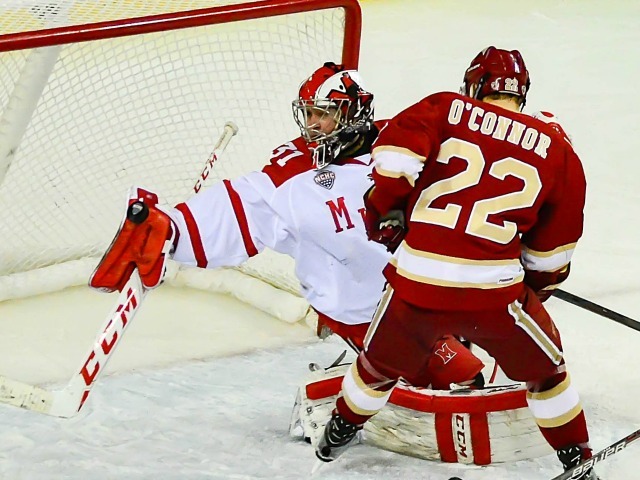 Morris found the net for the third straight game and Louis has recorded a goal in three of his last four contests. The Pioneers (12-8-5) took the early lead, as Troy Terry slid a pass to Danton Heinen through the slot, and Heinen went to his backhand to slip the puck past RedHawks senior goalie Jay Williams just 7:06 into the first period. But 90 seconds later, Louis dug a puck out of the corner, skated around the back of the net and stuffed it past goalie Evan Cowley on the far side to tie the score. Roslovic gave Miami (10-11-3) the lead when he hammered a centering pass from Morris home on the power play with 2:14 remaining in the second period. With just over a minute remaining in that period, senior forward Sean Kuraly was assessed two minor penalties, and Miami was forced to kill off four minutes of power play time. Williams made eight saves in the final period – two in spectacular fashion – and 20 overall to pick up the win, his fourth in a row and 41st of his career. That moves him into solo control of fifth place all-time on the team’s career leaderboard, ahead of Richard Shulmistra and five behind Connor Knapp. 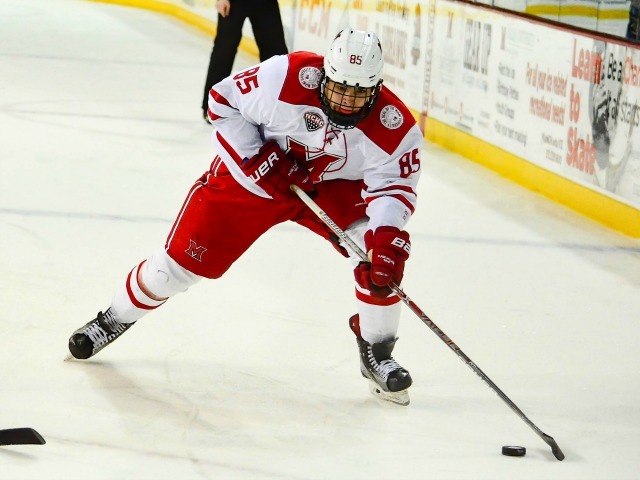 Morris skated in and tapped home an empty netter with 23 seconds to play, sealing the RedHawks’ win. He finished with a goal and an assist, and sophomore defenseman Scott Dornbrock picked up a pair of helpers. 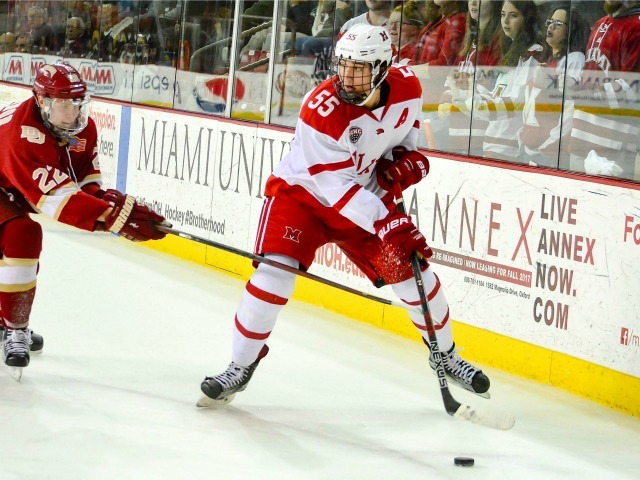 Louis and freshman forward Josh Melnick extended their points streaks to five games. Louis has three goals and three assists in that span, and Melnick has five helpers. Morris has a three-game goal streak, going 3-2-5 after picking up five points the first 21 games this season. 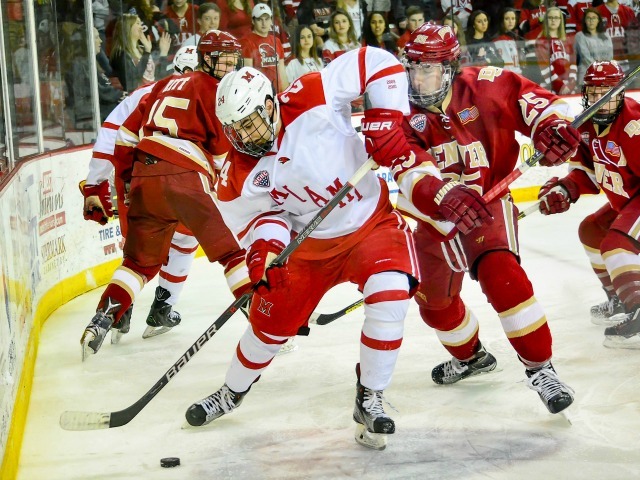 Senior defenseman Matthew Caito has also recorded points in three consecutive tilts (1-3-4). Dornbrock, who had one assist the first 22 games, has three in the last two games. 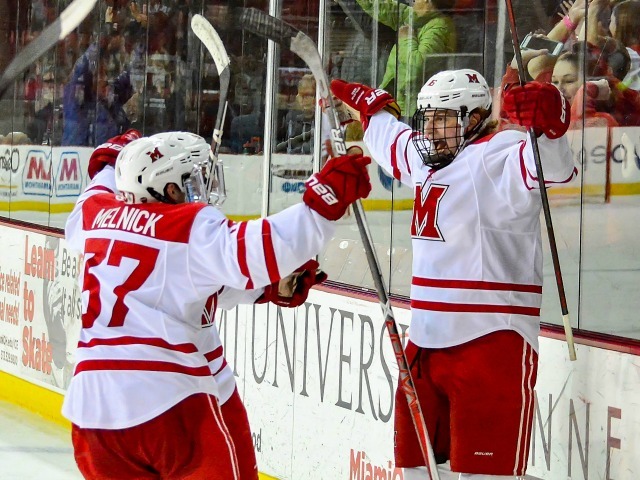 Miami vaulted Nebraska-Omaha and moved into a tie with Minnesota-Duluth for fourth place in the NCHC standings. UNO fell, 5-1 to Colorado College and UMD played an out-of-conference game. 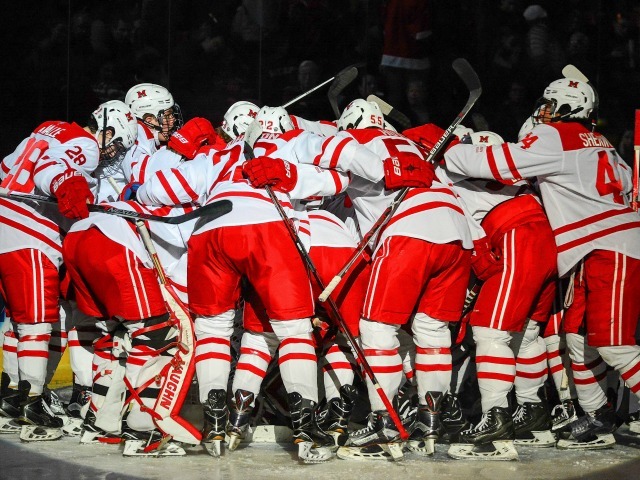 The RedHawks have a game in hand vs. Minn.-Duluth, against whom they finish the regular season on the road. 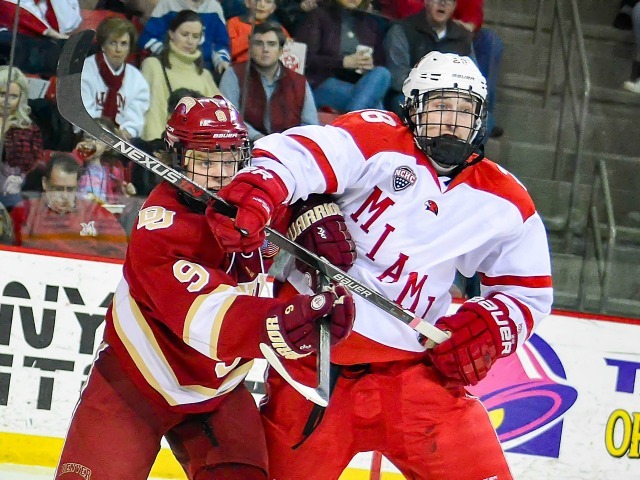 Miami surged into a tie for 18th in the PairWise rankings, which determine the teams that make the NCAA Tournament. 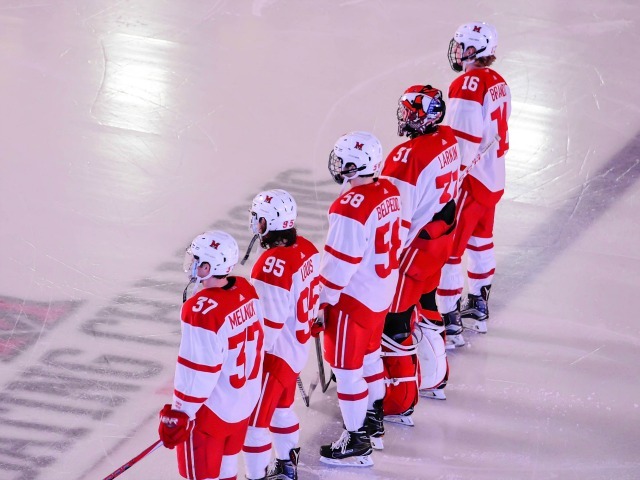 These teams wrap up their weekend series at 7:05 p.m. on Saturday at Cady Arena. > They never trailed. The RedHawks defeated No. 1 seed Denver 4-2 on Friday afternoon, punching their ticket to the quarter-finals of the NCAA Tournament. 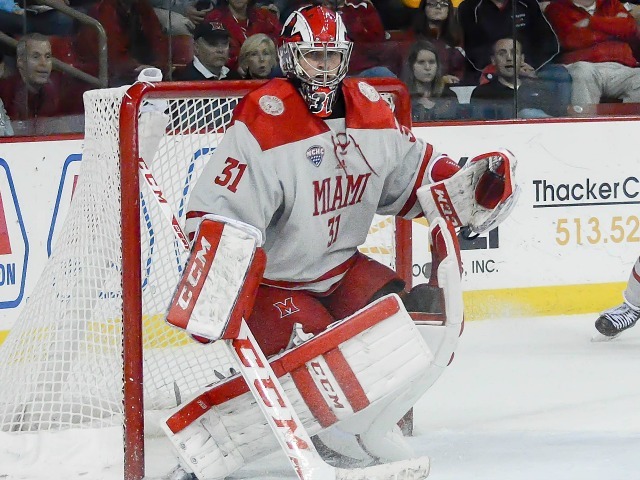 Miami jumped out to a quick lead in the first period, when senior Justin Mercier made a nice toe-drag and fired a wrist shot past Denver goaltender Marc Cheverie. It was the 50th of his Miami career. 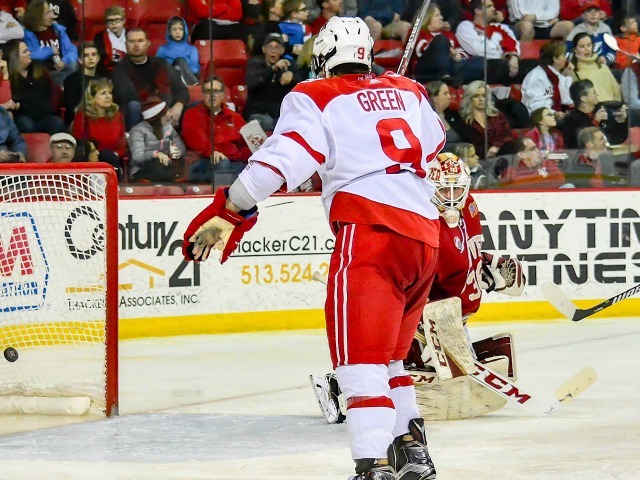 As time ticked down in the first period, the RedHawks struck again. This time, it was Alden Hirschfeld, netting his fourth goal of the season. The result? 2-0 Miami, end of the first period. The second period was much of the same. Uptempo, with the ‘Hawks seeming to take advantage of Denver’s defense and Olympic size ice surface and solid puck moving ability. They seemed to get behind the defense frequently on this day and their hard work paid off. Miami struck early again. Bill Loupee potted his second goal of the season, now giving the Red & White three goal lead. Denver finally found the scoreboard late in the second, when Joe Colborne deflected a shot past Miami goaltender Cody Reichard. It was a power-play tally that cut the Miami lead to two. Momentum was high on the Denver bench. They were…back in it, one could argue, but the momentum went the other way. A great effort by the hard working Andy Miele gave MU it’s fourth goal of the contest on a controversial play. Denver argued that the puck went out of play, hitting the netting above the glass behind the goal. Miele stuck with the play and buried the puck, despite the Pioneer protest. The goal stood after a short conference by the officiating crew, and the Miami lead was once again three goals. 4-1 Miami, end of the second period. Denver would score the only goal of the third period, when the returning Tyler Bozak scored another power play tally for the Pioneers. This was a curious decision by Denver bench boss George Gwozdecky, as he pulled goaltender Cheverie in favor of the extra attacker with around six minutes left in regulation. 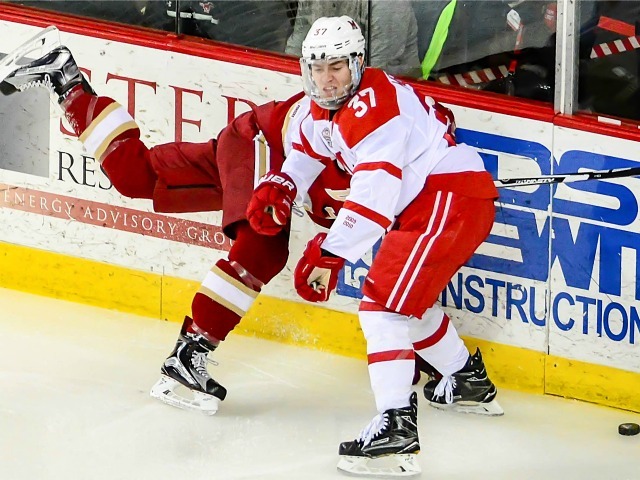 It was a 5 on 4 Denver advantage, with Miami’s Vincent LoVerde and DU’s Brandon Vossberg serving co-incidental minors. The move paid off and Denver once again only trailed by two. 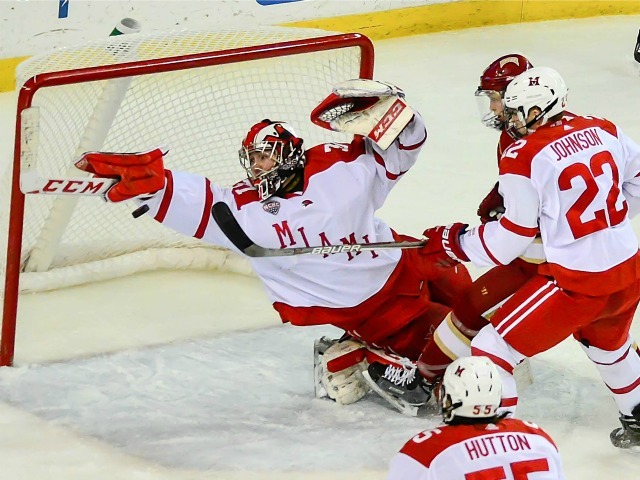 That’s the way it would end after some big saves late by Reichard, Miami found itself advaning in the NCAA tournament to take on the winner of the nightcap game- Minnesota-Duluth vs. Princeton. This game was Miami hockey. This looked like the team that we saw in the first half of the season, which is a very good sign. One issue of concern, was the powerplay. 0 for 5. Have to capitalize on man-advantage chances, but with the offense running like a well-oiled machine and the defense carrying it’s share of the load, things worked out for the better. Gwozdecky said after the game that coaching against Rico was “a little bit like coaching against your son.” I’m sure that even in defeat, Rico made “dad” proud. What a classy guy George Gwozdecky is. He is still revered by many in the Miami community and will forever be. This program has been here before…the regional finals. Never, in the soon to be storied history of Miami hockey has the team been past this stage. Teams with guys named Jones, Martinez, and Zatkoff didn’t make it past the quarter finals. This young Miami team, with no true nationally recognized “superstars” has a chance to do something great. Once again, we are one win away from the Frozen Four. Is this the year the chips get cashed in? We’ll know in 24 hours from now. 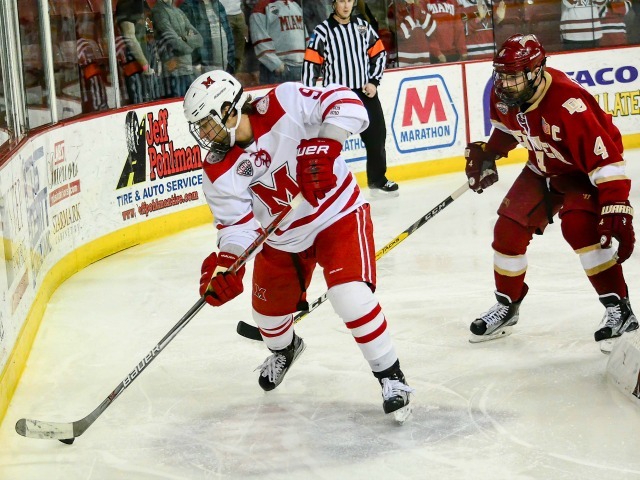 Looking ahead to tomorrow night, the RedHawks have a very tough test, once again. 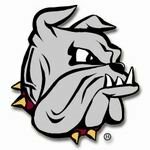 They’ll face a very good, very solid, University of Minnesota-Duluth squad. These guys are unreal. 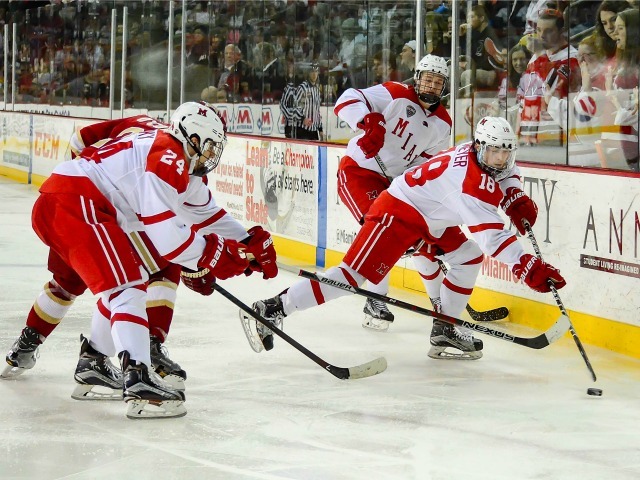 They’ve won five games in a row, after scoring twice in the last minute of regulation (including the game tying goal with 0.8 seconds left) and then netting the OT winner to defeat Princeton on Friday night. In my opinion, this is the hottest team in the country right now. 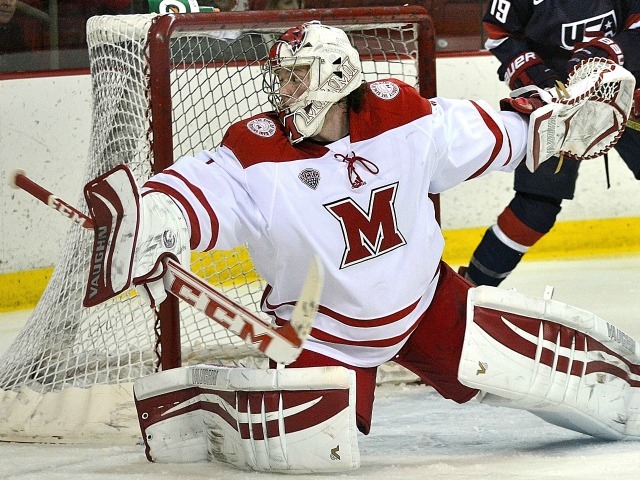 They bring the third best power play in Division I hockey and a very good netminder, in Alex Stalock to the contest. These two teams are very similar…both play a very fast paced game, have a share of small forwards, and move the puck very well. It is, however, a home game for the Bulldogs. Not literally, of course, but the distance from Duluth to Minneapolis…2 hours, 20 minutes. Oxford to Minneapolis? 11 hours, 16 minutes. 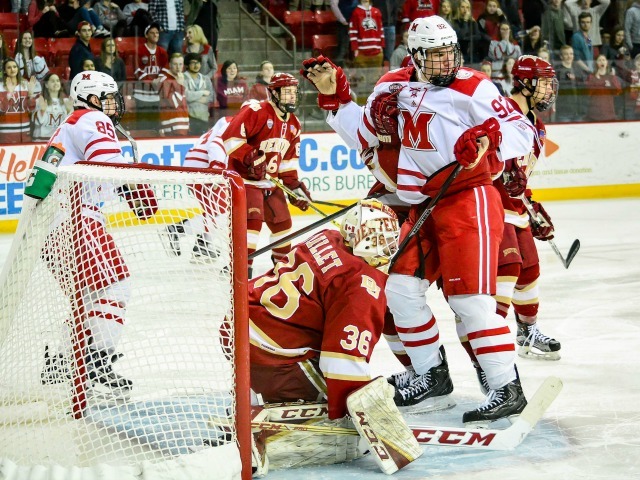 If Miami plays “Miami hockey” (see: 3/27 vs. Denver), things will take care of themselves and the RedHawks will be D.C. bound. Expect a tough contest, folks. We’re one win away. One. Go RedHawks. The puck drops at 9:00pm ET on ESPNU.